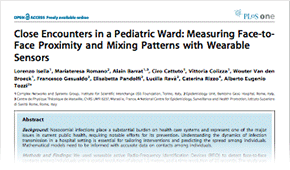 We have published a new paper about a recent study of face-to-face proximity and mixing patterns in a pediatric word at the Bambino Gesù Hospital in Rome, Italy. This study shows the feasibility of accurate and reproducible measurements of the pattern of contacts in a hospital setting. The obtained results are particularly useful for the study of the spread of respiratory infections, for monitoring critical patterns, and for setting up tailored prevention strategies.